Less than four years after Stevens Point received its charter, a daughter, the seventh in a family of nine children, was born to Stevens Point's first school teacher, Mandana Hale, and her husband, Nathaniel F. Bliss, real pioneers of the community. The daughter, now 96 years old, is Mrs. James T. Smith, who with her daughter, Miss Marjorie Smith, lives at 308 Pine St. Mrs. Smith is the last surviving member of one of the city's earliest pioneer families. The coming here of Mrs. Smith's parents dates back to the 1840s. Her mother figured prominently in the cultural background of the community and her father in the business field. Mrs. Bliss came here in 1847 to take charge of a small private school. On the trip north from Bonus Prairie, or Caledonia, Ill., she drove a "tote team" with a big load of supplies into the then almost trackless wilderness. The few residents of the growing settlement called Stevens Point, seeing the need for some instruction for their children, had taken up a collection to defray the expenses of conducting a school. The former Miss Hale opened her school in a building on the east side of N. 2nd street, just north of the Public Square. Frank’s Hardware Co. now occupies part of this site. 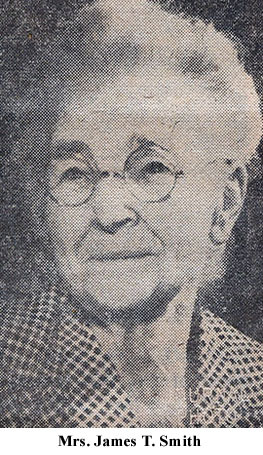 Miss Hale was one of the 14 white women in the area included between Plover and Wausau. As the compensation was small, this first school teacher found it necessary to augment her income by sewing for the woodsmen, from which she made more than she did from teaching. In the fall she returned to Illinois and remained there until the following June, when Mr. Bliss, whom she had met here in the pineries, went to Illinois and brought her back as his bride. They were married on June 1848, in Boone County, Ill. After their return to Stevens Point, Mrs. Bliss taught school for another term. Mr. Bliss came to the pineries via wagon in 1847 to take an active part in the development of the community. He was elected a justice of the peace the year following his marriage and he continued in the office for many years. He also conducted a real estate business and a store, supplying provisions for many lumbering concerns in the pineries. Through their business associations, both Mr. and Mrs. Bliss became widely known throughout central Wisconsin. The family home during the life of Mr. Bliss was on the east side of Water street, at the turn a block south of Clark street. He maintained his store next door to the home. Elections were held there during those days, and county offices were located on the second floor of the building after the county seat was moved to Stevens Point from Plover and the courthouse here was still under construction. The building later became the Bruce Hotel. After Mr. Bliss' death in October 1876 the family lived for some years on the Bliss farm that was located on the present site of the municipal sewage disposal plant. The farm home was at the west end of Bliss avenue, a street named for the family. 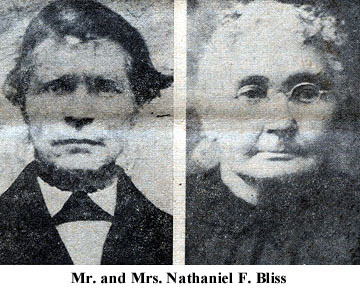 Mrs. Bliss, who died at the Bliss avenue home on Dec. 26, 1907, was born at Smithfield, Pa., on Sept. 18, 1826. Her husband was born in Pownal, Bennington County, Vt., in June 1808. The Blisses were the parents of five sons and four daughters. Their oldest child, Mrs. Geraldine Clark, was the first white girl born in Stevens Point on July 26, 1849. Widely known in the community, Mrs. Clark, wife of John P. Clark, was a leader in literary and cultural movements in the city. After her husband’s death, in 1887, for many years she conducted a grocery store he had established. She died in April 1942 at the age of 92. Of the couple's five children, a son, Ray, lives in Stevens Point. His home is at 313 McCulloch St. The other children of Mr. and Mrs. Bliss and the time of their births are: Adelbert, Sept. 25, 1850; Samuel Mason, April 7, 1852; Josephine, Dec. 19, 1854; Harvey, Dec. 31, 1855; Charles, April 21, 1859; Ann (Mrs. Smith), Feb. 6, 1862; Franklin, Aug. 22, 1864, and Susan, March 22, 1867. With the exception of the time she spent in travel, Mrs. Smith has lived most of her 96 years in Stevens Point. During her girlhood she traveled extensively with her maternal grandparents, visiting most of the states in the union. Before her marriage she worked in Iowa for a time and as a bookkeeper for a local store. She attended the Old White School which was located at the present site of the Lincoln School. Although there were no graduation exercises at that time, Mrs. Smith completed the elementary and high school courses in the same building. Two years after she completed her education, the practice of graduation exercises were started. Her marriage to Mr. Smith took place on May 11, 1884. Mr. Smith came here from Canada and was a carpenter and millwright. They lived for short periods at Wausau and Parrish. The couple celebrated their golden wedding anniversary in 1934. Mr. Smith died on June 27, 1937. The Smith home for many years was at 627 Elk St. Although confined to her home for the past several years, Mrs. Smith has maintained her alertness and sharp wit, with which she entertains her wide circle of friends, young or old, who call to see her. She is addressed by her family and close friends as "Gram." Mrs. Smith has two other daughters, besides Marjorie who is at home. They are Mrs. Elmer (Evelyn) Fors and Mrs. John (Susan) Thiell, both of Manitowoc. There are two granddaughters and three great granddaughters. Mrs. Smith recalls the early days when her father traded with the Indians, who would often call at the Bliss home with berries to sell. She remembers seeing Waberkinish, an Indian chief and a man of great note among the Indians. “Of the many incidents in my young life which I remember, one which is outstanding is when I went to school with my sister, Geraldine,” reminisced Mrs. Smith. “She made me sit between a Norwegian pastor and Jules Iverson for some trick I had played,” the near centenarian said with a twinkle in her clear blue eyes. Another incident clear in her mind was when four fingers on one of her hands were cut to the bone. The accident happened while she held a knife in her hand and a boy she knew pulled the blade through her closed hand. The principal early day figure prominent in Mrs. Smith's mind is a man named Caleb Swayze, publisher of the weekly Wisconsin Pinery, Stevens Point's first newspaper. Mr. Swayze was a friend of the family, and Mrs. Smith recalls going to his print shop to set type and getting all the magazines she wanted. On one occasion, when a photographer owed him quite a bill, Mr. Swayze told her to have all the photographs taken that she wanted. He included one condition. that she give him a large picturer for his office. Before ill health made it necessary for her to withdraw from fraternal work, Mrs. Smith was active in church functions and the Associated Charities. She has been confined to her home since she broke her hip in July 1944. During her long life, Mrs. Smith has witnessed many changes. Living from the kerosene lamp era to the age of fluorescent lighting, she has seen the transition from the ox team to the aeroplane, from wagon trails to super highways, from wood-fired cook stoves to electronic cooking. She was born while the Civil war was under way, and four more wars have been fought by her country in her lifetime, the Spanish-American War, World Wars I and II, and the Korean Conflict. STEVENS POINT TEACHERS in the 1870s are pictured here. At upper left is Mrs. Geraldine Bliss Clark, the first white girl born here and the daughter of Stevens Point's first school teacher. 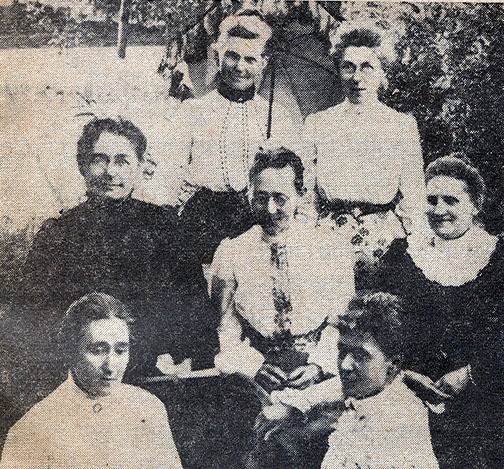 She was the mother of Ray Clark, 313 McCulloch St. Others in the photo are Miss Tina Johnston, Mrs. Josephine Richardson Powers, Mrs. Tessie Quinn Leonard, Miss Tina Kingsbury, Mrs. Alice Hawn Congdon, and Miss Tillie Agnew.